“I wish I had been prepared” is a common refrain heard from employees who have experienced workplace violence or an active shooter incident. The August 3, 2010, workplace shooting at a Connecticut beer distributor that left nine dead and two wounded is a stark reminder that the threat of workplace violence is real and the impact can be devastating. To be prepared for such an event, security managers of chemical facilities are conducting tabletop exercises that simulate a realistic active shooter event at a hypothetical chemical plant as part of a program supported by the U.S. Department of Homeland Security (DHS). The half-day exercise teaches plant employees, security managers, law enforcement, and first responders what to expect and how to respond if a gunman enters a chemical plant and threatens or harms people or processes. It allows representatives of law enforcement and chemical facilities to share information on the decisions they make, how they operate, and how to improve communications and coordination. The tabletop exercises are sponsored by the DHS Chemical Sector-Specific Agency in collaboration with state chemical industry councils, first responder organizations, and other security partners. On August 27, 2010, Nexight Group facilitated an active shooter tabletop exercise sponsored by DHS and the Missouri Emergency Response Commission at Osage Beach, MO. About 34 people participated in the exercise—the majority representing first responders and about 1/3 representing law enforcement—and they came away emphasizing the importance of repeated training and exercises for both law enforcement and chemical facilities in responding to an active shooter. 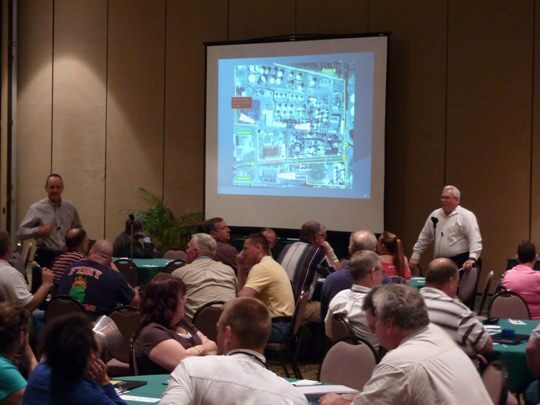 On August 31, 2010, Nexight Group facilitated a second tabletop exercise in Akron, OH, that was sponsored by DHS and the Ohio Chemical Technology Council. The exercise included 58 chemical facility employees and about 13 first responders, law enforcement officials, or local emergency management coordinators. Participants left with a greater understanding of the need to coordinate closely with law enforcement and first responders during emergency planning. Participant responses during the exercise and lessons learned are captured and included in an After-Action Report that is sent to participants shortly following the exercise. This helps participants retain what they learned and share it throughout their organization. DHS also provides an active shooter response guide, a best practices guide, and a security awareness guide at each exercise. Mr. Eisenhauer and Nexight Group Communications Specialist Lindsay Kishter teamed up with security expert Jim McGinty, vice president of training and safety at Covenant Security Services to facilitate the exercise. In addition to Mr. McGinty, the Missouri and Ohio exercises included experts John Gnagey, executive director of the National Tactical Officers Association, and Dr. Sam Mayhugh, founder of Integrated Behavioral Health. On September 1, the day after the Akron, OH, tabletop exercise, a gunman entered the Discovery Communications building, directly across the street from Nexight Group offices in Silver Spring, MD. The planned and coordinated action by Discovery Communications management, their employees, and the Montgomery County Police Department drove home the message that good preparation can help prevent a dangerous situation from becoming a disaster.